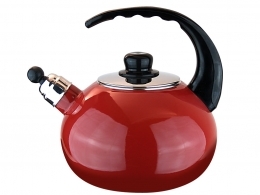 The Magefesa Coral tea kettle is the biggest of these 3 reviewed with a capacity of 2.3 quarts. It has an ergonomic design on the bakelite handles that makes sure you will never find the handle anything but cool to the touch. It comes in 2 colors with a stainless steel lid that is easily removed for cleaning or pouring in water. It also has a metallic whistle to alert you when the tea is boiled.